A user wanted to know how to sort email messages by domain. Although you can filter by domain simply by typing the domain name in the address field, you can't sort as easily. Unfortunately, you can't sort by formula fields. 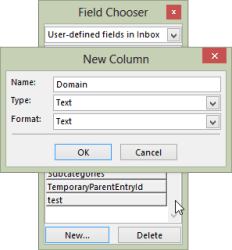 However, custom Text fields are sortable and you can use a macro to add the domain to the custom field. How to display the sender's email address in Outlook to add the sender's email address field to the view. To use the first macro, select the messages then run the macro. To add the domain field to messages as they arrive, you'll need to use the run a script rule below. If you use Exchange server, the field will contain the Exchange x.500 address for mail from Internal senders. The easiest fix is to use an if statement to look for an @ sign. No @ sign means it's internal email. You can then enter your domain for these senders or use their alias. Click on the Domain name to sort..
Use the following macro in a run a script rule. If you need instructions, see Outlook's Rules and Alerts: Run a Script. This macro gets the first email address a message is sent to and adds it to the Domain field. You could loop through the entire recipient list and get all addresses or domains, but the list is a simple text list and sorts by the first domain, making it less useful. This macro works on both incoming messages and messages in your sent folder. You can customize the macro to work with other fields. In this example, I'm adding a text field containing the received date formatted in Month day format. Don't forget to use a unique name for the field! Tip: if you want to sort by a date field, use "yyyy mm dd" for the date format, use olDateTime instead of oltext. Yes, it would be less confusing to use a generic object name, like objItem, but as long as the field is supported by the declared object, it will work. Dear Diane, I added a New Column, named DOMAIN, selected all the messages in my Inbox, around 10000, and ran the macro. First it took ages to populate the Domain field values. Second upon clicking Sort, it simply was not doing it, descending or ascending. Then I noticed, it does some sort of sorting, but could understand it is an extremely slow process. The same process I tried in another mail folder, with 250 messsages, and I was able to sort and group by Domain values. Kindly help me implement the same process for my Inbox, as I really want to clear all the Junk/Useless mails, which are from around 3000 senders, but if I can group them by Domain, it would be a few hundred. Sorting the messages according to the number of messages based on Domain values, instead of alphabetic sequence, would be the next step, but this can be a secondary goal. Thanks for your kind help. Yeah, its definitely a slow macro - it needs to touch every message. I don't believe t can be speeded up. Sorry. (Sorry I missed this earlier). How to remove the field andits contents if the Macro did not work correctly? I run the AddDomain Macro and it worked on the emails coming from outside my company but for the emails that come from inside my company the field added something like this: "/o=company/ou=exchange admin...". I will like to undo what I did until I figure out how to adjust the script. Any ideas? It gives nothing. I added on Error resume next and changed objMail with Item but still this line is not working. What could be the issue? I thought of another solution. 2-Via a macro, browse the folder to add the item number by sender.